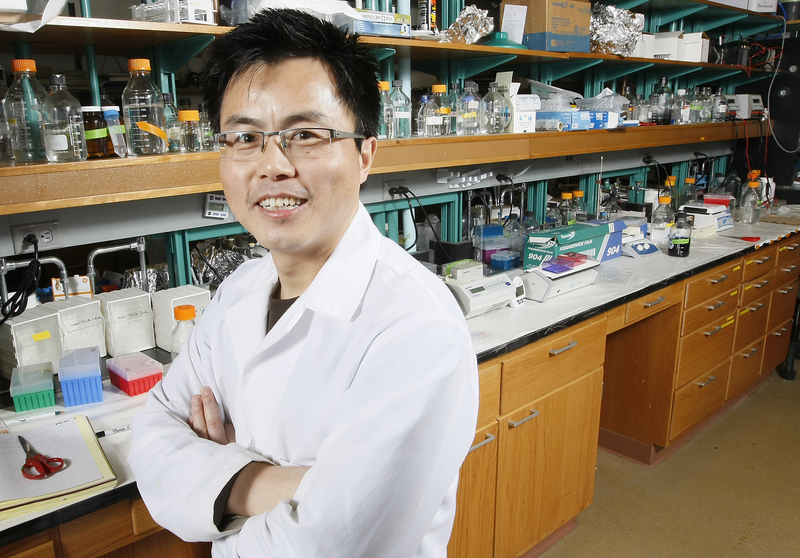 W. Andy Tao, an associate professor of biochemistry analytical chemistry, developed a nanopolymer that can be coated with drugs, enter cells and then removed to determine which proteins in the cells the drug has entered. Since they’re water-soluble, Tao believes the nanopolymers also may be a better delivery system for drugs that do not dissolve in water effectively. Knowing which proteins are targeted would allow drug developers to test whether new drugs target only desired proteins or others as well. Eliminating unintended protein targets could reduce the often-serious side effects associated with cancer drugs. Tao said there currently is no reliable way to test drugs for off-targeting. He said drugs are often designed to inhibit or activate the function of a biomolecule associated with cancer, but those drugs tend to fail in late-stage clinical tests. Tao also believes his nanopolymers could better deliver drugs to their targets. Since they are nanosized and water soluble, the nanopolymers could gain access to cells more effectively than a standalone drug that is only minimally water-soluble. Tao has shown the nanopolymer’s ability using a metabolic drug, which are small, low-cost drugs but are less target specific and have more side-effects. He now plans to do the same using drugs that are based on synthetic peptides, which are larger and more expensive but more specific and with fewer side effects. The National Institutes of Health’s National Center for Research Resources and a National Science Foundation Career Grant funded the research. Drug-conjugated dendrimers were used in combination with mass spectrometric analysis to identify drug targets in vitro and in living cells. In this proteomic strategy, the drug-conjugated nanopolymer is incubated with cells to ensure efficient delivery, and the cells are then lysed. Proteins bound to the drug are isolated on a solid support and identified by mass spectrometry.